We offer four classes of apartments for different budgets and needs. Online lodging reservation is available on our site. All apartment listings are supplied with detailed photos and descriptions. Budget apartments, furnitured and supplied with all necessary things for comfort, will make you feel yourself real Petersburger living at the heart of this fascinating city. For a moderate price you'll get a renovated 1, 2 or 3-room furnished apartment with modest decoration and full set of kitchen and household equipment (cooking plate with oven, kettle, toaster, fridge, washing mashine, cable TV, audio). We’ve been offering apartments for rent in St Petersburg since 2000. Our apartment rentals include budget, tourist-class, business-class and luxury accommodation for short and long-term rent. All our apartments are in the very center of the city, within walking distance from Nevsky prospekt, Winter Palace and other main St Petersburg sights. Besides accommodation, we provide Russian visa support, airport transfer, city tours and multilanguage guides. Dear friends, we are happy to help you with your accommodation during your visit to our beautiful city. Necessary equipment: fridge, microwave oven, kettle. All necessary equipment. Match three-star hotel room. Modern furniture and decoration, qualitative domestic equipment. Modern design and furniture, jacuzzi, sauna. Hurry up to book wonderful apartment for your trip in New Year holidays with 15% discount. Tourist-class apartments, well-furnished and supplied with all necessities for living, will make your St Petersburg holiday housing as cozy as home, and at a reasonable price. You get renovated 1, 2 or 3-room apartment with modern furniture and better decoration. Full set of kitchen and household equipment (as above) included. Businessmen would prefer our business-class apartments situated in downtown, equipped with high-speed internet, tv/audio/video gadgets and good for meeting and talk on business matters. These apartments have fine modern decoration and furniture, jacuzzi and heated floor in the bathroom, built-in techniques and furniture with dish-washing mashine in the kitchen. Most exigent visitors will enjoy our luxury apartments with elegantly designed interiors, stylish furniture and working fireplace, for example in prestigious Bolshaya Morskaya street with its art galleries, elite boutiques and restaurants. Our elite apartments have excellent interior (often of authorial design), jacuzzi or sauna (or both), built-in up-to-date kitchen techniques. These apartments are the best choice for the guests preferring highest comfort and quality. Besides apartment reservation service, on this site we provide a plenty of information on St Petersburg, its history, culture, attractions and entertainment. Some of these are briefly described below. Of course, to go and stay in Russia, a foreigner should obtain a visa. We will help you with getting Russian visa and provide all necessary info such as application procedures, customs rules, consulate addresses, etc. The city can be reached by plane from any country or by train and bus from within Europe. 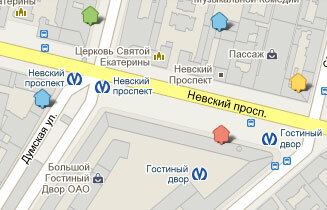 We provide car rental and transfer from / to airport Pulkovo which is situated about 20 km away from the city center. Local transport includes subway /the underground/, buses, trolleys, trams and taxis. Our city is beautiful in any season. But the best time to visit St Petersburg is white nights which last from the beginning of June till the middle of July. The city is immersed into mysterious twilight so an encounter with characters from novels by Pushkin or Dostoevsky, who lived and worked here, doesn’t seem casual in fantastic Petersburg night streets. Called "Northern Capital" of Russia, St Petersburg is a city of palaces, museums, theatres, parks, rivers and canals. Our Petersburg sights page will guide you through main places of interest such as Hermitage, Russian museum, Peter and Paul fortress, St Isaac Cathedral, Mariinsky Opera and Ballet Theatre (former Kirov Theatre), and other attractions. We invite our guests to Petersburg sightseeing tour along Nevsky prospekt and visiting major city attractions. Long distance tours including city outskirts and other places of interest are also available. To save your time we arrange tickets reservation for museums, theatres, concerts, shows and events. For 200 years St Petersburg was the capital of Russia and Russian emperors erected their summer residences in city suburbs. Worldwide famous ensembles of Pavlovsk, Pushkin and Peterhof are among top masterpieces of Russian baroque with impressing imperial palaces and picturesque gardens decorated with sculptures. St Petersburg offers not only authentic Russian cuisine (see brief description in our restaurant guide but dining in various styles including French, Italian, Japanese, Irish, Chinese and many others. As the sun goes down, the streets are filled with dressed up people and the city starts its vibrant nightlife in numerous bars, dancing halls and night clubs. Whatever you are – a business man, a family on vacation, or even a student doing a paper on Russia – if you wish to save on lodging and yet need more privacy and convenience , you are in the right place. We will make your stay in St Petersburg hustle free and comfortable. St Petersburg, one of the most beautiful cities in Russia and in the world, gets 4,500,000 tourists a year, including 2,200,000 visitors from abroad. St Petersburg offers many different accommodation options for its guests. Tourists may choose from vacation rentals in scenic city suburbs, bed and breakfast lodging, and luxury accommodation on famous Nevsky prospekt. Hotels in St Petersburg meet most exacting requirements of travellers except of one point – city hotels are extremely expensive as compared to those in other major European cities. Rental apartment is a good alternative to expensive hotel rooms. Located in historical center of the city, in renovated buildings, well-equipped with all modern household techniques, apartments are very cozy and convenient but cheaper than hotels. Apartments lease has been the old tradition in St Petersburg coming from years when lack of hotel suites occurred in comparison with tourist stream. Here you can become acquainted with main features and advantages of renting apartment for your stay in our city. Renting apartments is more affordable than staying in the hotel or mini-hotel. Let’s compare: Double Suite in the good-quality mini-hotel located in downtown costs about 4000 Roubles (about 110 euro) per 1 guest. At the same time, 2-bedroom standard apartment (with livingroom and kitchen), accommodated 4-6 guests, with all necessary household equipment will cost also about 110 euro (depending on the season), and that’s the price for all apartment, not for 1 guest. While renting apartments you will get qualitative service which has minimum differences from hotel service. Housemaid service and linen change (once a week) are included in the rent fee. You will be provided with all necessary small items – shampoo, shower gel, soap, towels, kitchen detergents etc. Apart from comfort of accommodation you will stay in the very heart of old Petersburg, nearby Nevsky Prospect and many famous historical points of interest. Besides, some of apartments windows face city rivers, canals, embankments and other sights. Apartment on Bolshaya Morskaya str.